What's hot, steamy and worth some attention? Your bathroom! Transforming your personal space is easier than you might think. A well designed bathroom should be a haven where one can escape and find peace. You don't have to endure a whole bathroom remodel to enjoy a fresh look. Without spending a lot of money, you can freshen up your bathroom with organization, fresh color, updated lighting, and good accessories. Go online for many bathroom decorating ideas, or check out your local home building supply store. This first project won't cost a cent, but will yield great results. Take everything out of your drawers and cupboards, off counters, and out of the medicine cabinet or vanity. It should look the way it did when you moved in. Choose only the must-have's and find the most convenient place to put them. Anything that is not essential should go out. Once you've decided what you cannot live without, decide what you need to get it organized. You can find great clear plastic boxes, bins, drawer dividers, and clear cosmetic bags for things out of sight. For items that will stay on the counter, find decorative storage items to enhance the decor. Use turntables to minimize storage for tall bottles of hairspray, toothpaste, or shaving cream. See-through boxes and pull-out drawer units are handy. If you don't have enough room for another towel bar, try a decorative hook or two for hanging a robe or towel? Install it near the shower, on the back of the door, or near the sink. They won't take up a lot of space, but will still get things off the floor. Add a small piece of furniture. Even if your bathroom is small, you could probably find room for a small shelf or chest. A large bathroom could use the storage space offered by a decorative cupboard or armoire. Even a small chair would come in handy! Any piece of furniture will help to soften the space of a utilitarian bathroom and add style, color, and warmth. Freshen up the floor. A simple new colorful rug can work wonders! Or if the flooring is really bad, consider either covering it with a large cut-to-fit bathroom rug, peel-and-stick tiles, or even paint! . Truly the most obvious of all bathroom decorating ideas - paint a fresh, clean color. If you're a resourceful and energetic homeowner, you might want to tackle repainting the bathroom in a weekend. The job itself really won't take too much time, and the results will be worthwhile. If you're adventurous, try one of the many faux finishes that will make your walls really distinctive. And, if your walls are in good shape, it's not hard to stencil a simple border or design around the baseboard, mirror, ceiling, or window. This project will add a pattern to the room and help to either introduce a theme or enhance a theme that you've chosen. Choose colors for the stencils that will catch the eye. Also, consider a contrasting color for the baseboard. Paper the walls. Wallpapering is not a job for the faint at heart; but a small room like a bathroom is a good place to start. Choose paper that is made to withstand humid areas and pick the appropriate paste. You'll need to shop for and order the paper well ahead of time. If the whole bathroom seems like too big a job, paper on one wall will really update and transform the space. Add a border paper. Border wallpapers are sold by the yard and can be custom-ordered or purchased from the in-stock section of the home store. A border 6" to 12" below the ceiling, around a mirror, above wall tile, or bordering a doorway adds interest. When choosing a border to go all the way around a mirror, be sure you select one that looks good upside down. And either hand-cut around a pattern or mitre the corners for a professional look. 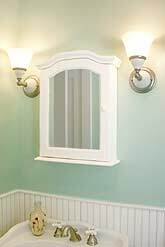 Other bathroom decorating ideas include adding fabric to windows and shower enclosure. Either a bold, colorful floral print or simple check or stripe can add color to windows or showers. You can purchase or make a shower curtain or window valance to put color around the room. Cording or coordinating accents add a decorator touch. For a powder room or extra bath that doesn't get a hard workout, elegant silk accents on walls and light fixtures create an exotic, luxurious feeling at a small expense. Coordinate your bath towels and rug. Colorful towels to coordinate with your decor bring color to the walls and a feeling of luxury. If your towels are acceptable, add trim to spruce them up with a decorator look. Simple ribbon banding above the border is a great touch. Be sure to wash the ribbon banding before sewing it on the towels, as it might shrink with the first wash. Or bring in extra color buy adding colorful hand towels or washcloths as accents. Don't overlook adding a fresh, colorful new rug. Almost any cabinet can be easily and inexpensively updated with new hardware�one of the easiest bathroom decorating ideas! If your cabinets don't have any, be sure to measure carefully before drilling the holes. Choose the hardware to enhance your decorating theme. Shells or fish shapes fit in at a lake cabin. Wrought iron or white ceramic looks great in a country setting. Shaped pulls formed as twigs and leaves are fun in the mountains. If you can't find just the right one for your bath, check out the many online sites that offer fun motifs.